Response envelope: milkweed A2 size (4-3/8x5-3/4). Tall and textured DIY Eco Invitation. Tree free & post-consumer recycled papers. Green and natural colors. Finished invitation measures 9-1/2" x 4-3/4"
Natural and rustic invitation with a leaf embossed wrapper. Wrapper has an natural deckled-edge. The wrapper is a handmade cotton rag paper that is embossed and imprinted by real leaves. (which are laid onto the paper during the drying phase of papermaking). Each wrapper is slightly different pattern - created by this process. Invitation is printed on milkwedd recycled cardstock. 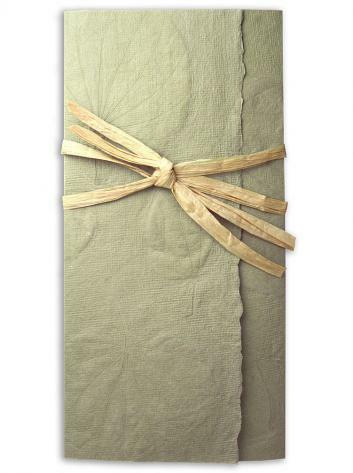 Closes with a sage green paper raffia tie. Wrapper is die-cut (holes for the raffia) and scored for easy assembly. Colors: Light olive green with tan leaf impressions. and sagey olive paper raffia. Invitation is a complex soft white with yellowish overtones. Wrapper:Handmade botanical leaf paper. One natural deckled edge. Scored and die-cut. Envelope:Custom shaped 100% post consumer recycled opaque envelope. Tie:One yard of sagey-olive green mulberry paper raffia.